Info "Stupid pen! Why won't it write?!" Writer’s Block is one of Kat and Ana’s Microgames in WarioWare: Smooth Moves. The name is a pun on "writer's block". 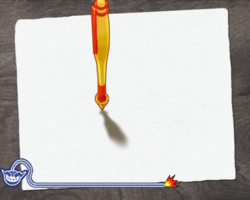 The player must scribble the pen over the paper several times to make the ink appear. As the levels progress the pen will look fancier. 1st level difficulty: It will not take long to get it writing. 2nd level difficulty: It will take a longer time to get it writing. 3rd level difficulty: It will take a very long time to get it writing. This page was last edited on February 19, 2018, at 17:55.